The final weekend of the Scottish National League took place on Saturday 19th March at Drumchapel Sports Centre and High School. North Ayrshire Table Tennis Club’s (NATTC) Division 1 team consisting of Richard Main, Christopher Main and Colin Dalgleish had won this division the past 4 years however they knew it wasn’t possible to win this season as they were too many points strengthened sides Drumchapel TTC and Knightswood TTC. After an impressive win over Edinburgh Murrayfield winning 6-0, they couldn’t capitalise on this firm losing out to Knightswood and eventual runners up 4-2 in a closely fought match. NATTC finished in 4th spot and will look to improve on this position next year. 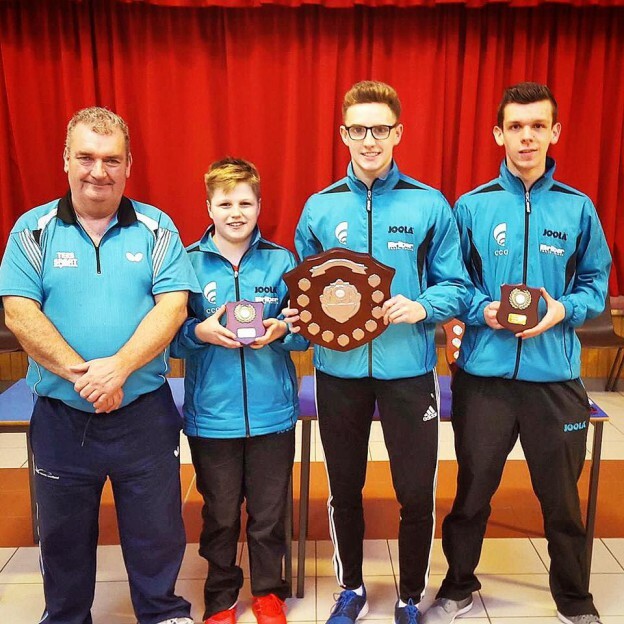 Drumchapel TTC went on to win this division as they remained unbeaten throughout the season. In the 3rd division, NATTC’s team of Andy MacPherson, Chris Barclay and Martin Johnson were in prime position to win the league and gain promotion to the 2nd division. With an excellent win over Edinburgh Murrayfield 4-2 in their first match, it would mean that NATTC had to win their final match 4-2 to win the league on points difference. NATTC took the lead 3-2 in this high stake match, which meant 13 year old Martin Johnson had to win the last match to win the league and seal promotion, which he did in emphatic fashion winning 3-0. Great team effort throughout the season and thoroughly deserved, congrats. NATTC’s 4th Divison team consisting of Jill Taylor, Ryan Henry and Robin Wilson ended their 2015- 16 national league campaign with a 6-0 win over North Merchiston (Edinburgh) and a close 4-2 loss against Triangle (Aberdeen). This meant that they finished in a commendable 5th place and will also look to improve on this position next year and challenge for promotion into the 3rd division. This entry was posted in Latest News on 23rd March 2016 by Chris Main.